In the NLDS, Stephen Strasburg was absolutely brilliant for the Nationals in his two starts. Due to an injury to Max Scherzer, Strasburg got the ball for Game 1 and was dominant. He threw 5.2 innings of no-hit ball before giving up back-to-back RBI singles to Kris Bryant and Anthony Rizzo that allowed two unearned runs to score thanks to a rare error by Anthony Rendon. Strasburg finished with an impressive line of 7 IP 3 H 2 R 0 ER 1 BB and 10 K in a losing effort. Although his outing was ruined by the unearned runs and Kyle Hendricks’ outstanding start which shut down the Nationals offense, Strasburg made the Cubs hitters look foolish all night long. Getting the ball once again with his team down 2-1 in the series, Strasburg turned in another absolute gem in Game 4. In a 5-0 victory, Strasburg threw seven shutout innings, scattering three hits while walking two and striking out 12. In his two starts combined, Strasburg threw 14 innings without allowing an earned run, while only giving up six hits with three walks to go along with 22 strikeouts. The dominance on display by Strasburg is nothing new. Despite being the second-best pitcher on his team, Strasburg is an ace and finished second (behind Scherzer) among NL pitchers with 5.6 WAR. When Strasburg come to mind, the immediate thought goes to his power fastball. It’s one of the main reasons why the Nationals selected him with the first overall pick in the 2009 draft. He throws the pitch with an average velocity of 95.6 MPH good for fifth among qualified pitchers. Yet, Strasburg also loves to throw changeups, especially to right-handed hitters. Throughout the course of the regular season, Strasburg threw 16.3% changeups to right-handed hitters. This is an absurdly high amount for a power pitcher like Strasburg. Typically right-on-right changeups are primarily thrown by low-velocity sinkerballers, since changeups typically have the same movement as their sinker despite being thrown 5-10 MPH slower. Conventional wisdom has dictated for years that power pitchers should throw fastballs and curveballs (or sliders) to the same-handed hitters while throwing fastballs and changeups to opposite-handed hitters. The idea behind this is to throw a breaking pitch with movement that breaks away from the hitter, making it harder to hit. Right-on-right changeups were regarded as a dangerous pitch since a mistake almost always ended up with the pitch being barreled. In 2013, Ben Lindbergh wrote an article for Baseball Prospectus about the Tampa Bay Rays (because who else besides Joe Maddon and Andrew Friedman) and their increased usage of same-sided changeups (this article includes left-on-left changeups as well). However, the team refused to recognize this increased same-sided changeup usage as an intentional move, but rather tried to classify it as an increase in the emphasis on throwing changeups to all hitters regardless of handedness. As a team in 2013, the Rays led the league in percent of same-sided changeups, as 15.9% of all pitches thrown to same-sided hitters were changeups. The league average was 5.4%. This league average has held relatively constant over the last four years. Using Statcast data from 2017 for all right-on-right pitches thrown by starting pitchers, 6.6% of all right-on-right pitches were changeups. Back to Strasburg. Throwing his changeup 16.3% of the time to right-handed hitters, he generated a whiff rate of 27.2% while only allowing five hits and 13 other balls in play, on 213 changeups. 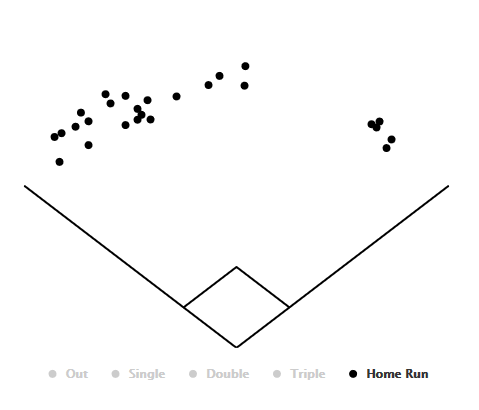 Four of those five hits were singles, while the other was a home run hooked down the line by Josh Harrison (hit probability of 13%). He used his changeup primarily as an out pitch, as most were thrown down and in with two strikes. It totally makes sense for Strasburg to use his changeup so much, as it is one of the best pitches in baseball, and it really is its own animal. It’s unique because he throws it really hard. It was the second-hardest changeup among qualified starters, coming in at an average of 88.7 MPH. Despite throwing it so hard, it was 7 MPH slower than his average fastball, right in the ideal range of velocity differential. It also has a decent amount of arm-side run to go along with late and sharp drop (as can be seen here). According to the Pitch Values assigned by FanGraphs, Strasburg’s changeup was fifth best among qualified starters in total value, and 10th best on a per-pitch basis. In his Game 1 start, Strasburg threw six right-on-right changeups out of 45 pitches (13.3%) and generated four whiffs with zero balls in play. This was right in line with his season averages, which would’ve been expected to continue in Game 4. But this was not the case. It was reported on Tuesday that Strasburg was sick and would not pitch on Wednesday despite being on regular rest after the rainout. Yet, on Wednesday morning, plans changed and he was announced as the Game 4 starter with the Nationals season on the line. As mentioned earlier, he did his job by turning in a spectacular start, and the Nationals’ season lived to see another day. However, in Game 4 Strasburg decided to get funky. He threw 16 right-on-right changeups out of 45 pitches, equal to a whopping 35.6% of the time, and generated eight whiffs with one ball in play hit at 27.7 MPH. His changeup and its increased usage was no doubt a huge factor in shutting down the Cubs once again (as can be seen here, here, and here). Who knows why he decided to go to it so much more often. Maybe he saw the success he had with it in Game 1, or maybe that pitch was the most comfortable for him to throw while supposedly not feeling well (his average fastball velocity of 95.4 MPH suggests he was feeling just fine). No matter what it was, it doesn’t matter. Strasburg has proved that the right-on-right changeup can not only be an effective pitch, but an absolutely devastating one. A pitch that can even be used over a third of the time. Let’s see if hitters will be able to adjust. The Colorado Rockies have been one of the biggest surprises this season with a 58-45 record, after going 75-87 last season. Currently, FanGraphs gives them a 64.8 % chance of making the playoffs as a wild-card team. Despite an offense that ranks 29th with a wRC+ of 83, their defense and baserunning have been strong suits, with the eighth-ranked defense and fifth-ranked baserunning. Their pitching staff has been around the middle of the pack (24th in ERA, 19th in FIP, 17th in xFIP) but this is a huge feat while pitching half of their games at the hitter’s heaven of Coors Field. This year, success has come in the form of a young starting rotation that ranks fourth in ground-ball percentage (48.6) and 11th in HR/9 (1.27) among all starting rotations. That’s right, while playing half of their games at Coors Field, the starting rotation has given up fewer HR/9 than 19 teams. Much of the credit for this success goes to rookie left-hander and ground-ball machine Kyle Freeland. Taken eighth overall in the 2014 draft out of the University of Evansville, Freeland spent two and a half seasons in the minors that included him missing time in 2015 with a shoulder injury, before being called up to start the 2017 season in the Rockies’ rotation. To date, Freeland has thrown 116.1 innings with a 3.64 ERA and a 4.71 FIP while having the third-highest ground-ball rate (57.0 %) among qualified pitchers, to produce 1.4 WAR. What immediately sticks out about Freeland is the huge difference between his ERA and FIP. While FIP is typically higher than ERA for ground-ball pitchers, Freeland is still an extreme case, with his -1.07 ERA – FIP. Like most ground-ball pitchers, he doesn’t get many strikeouts or swings and misses; his 14.4 K% is the third-lowest among the 71 qualified starters, and his swinging-strike rate of 6.9 % is the lowest among qualified starters. However, unlike most ground-ball pitchers, Freeland walks a ton of guys; his 8.8 BB% is 15th-highest among qualified starters. And even more unlikely, while pitching at Coors, he’s allowed the 17th-fewest HR/9 (1.01) to go with a .281 BABIP. Now it’s time to take a look at the stuff behind those results. Freeland features primarily a three-pitch mix of a four-seam fastball, sinker, and cutter, while also possessing a slider and changeup. His four-seam and sinker are his two best pitches (and only two pitches he has with a positive pitch value according to FanGraphs). As a left-handed pitcher, Freeland has above-average velocity on his fastball, averaging 92.8 MPH with his four-seam and 92.0 MPH with his sinker. Both of these pitches have above average arm-side run and sink, with his four-seam averaging 5.75 inches of horizontal movement with 6.34 inches of vertical movement (it really means that this pitch, on average, drops 6.34 inches less than a pitch thrown at the same velocity with no spin) and his sinker averaging 7.92 inches of horizontal movement and 3.51 inches of vertical movement (the lower the number, the more sink a pitch has). His fastball and sinker both have above-average sink, but his sinker actually has less horizontal movement than an average sinker and is more of a two-seam/sinker hybrid (Statcast categorizes it as a two-seam while the folks over at Brooks Baseball classify it as a sinker). Yet both of these pitches generate a ton of ground balls and combined are used 65.8 % of the time by Freeland, which is the third-highest FB% among qualified starters. On the other hand, Freeland throws his cutter 20.5 % of the time at an average of 86.9 MPH with -0.46 inches of horizontal movement, to go with 3.18 inches of vertical movement. Due to this vertical movement, Statcast (differing from Brooks Baseball once again) classifies the cutter as a slider despite its low horizontal movement. Freeland’s cutter is truly a cutter/slider hybrid as it has a lot of tilt (like a slider) but doesn’t have much horizontal movement (like a cutter). The way he uses this arsenal varies greatly when facing left-handed hitters and right-handed hitters. Against righties, Freeland throws his sinker 37.1 % of the time, his four-seam 30.7 % of the time, and his cutter 17.1 % of the time. The idea here is to mix in the sinker thrown down and away with a four-seam thrown in, and a cutter thrown either down and in or over the outer edge of the plate as a backdoor pitch. Against lefties, Freeland throws his four-seam 44.4 % of the time, his sinker 14.0 % of the time, and his cutter 33.0% of the time. Just like against righties, Freeland throws these pitches in the same areas of the zone, throwing his four-seam to his glove side, sinker to his arm side, and cutter to both sides. However, all that changes is how much he uses each pitch. Against both righties and lefties, Freeland pounds the lower outer half, but isn’t afraid to come back inside, usually up and in. This mix is tough for hitters on either side of the plate as these three different pitches all come from the same arm slot and start off heading in the same direction, but break off in different directions, allowing Freeland to miss the middle of bats and generate ground balls. This arsenal has also allowed Freeland to be almost equally effective against righties and lefties. Although it is a small sample, he has faced 102 lefties that have produced a slash of .271/.317/.409, good for a .310 wOBA, and 398 righties that have produced a slash of .253/.345/.398, good for a .324 wOBA. Only 24, Freeland remains in the early stages of his career, and a sample of only 116.1 innings is nothing. Although he has gotten soft contact at a 25.0% rate, which is the best in the league, we can probably still expect some regression on balls in play. However, since Freeland is a pitcher that relies on the ground ball, his ERA will most likely not regress all the way up to his FIP, especially with strong infield defense behind him. The biggest issue for him to fix in order to sustain his success will be his walk rate. With his high fastball usage, Freeland has no excuse to continue to walk guys, and increased control should come as he ages. Most importantly, the Rockies will be leaning on him as they make a push for their first postseason appearance since 2009. Best-case scenario, Freeland becomes a fixture in the Rockies rotation as their new prototype for success at Coors Field, and leads them into the postseason for the first time since Ubaldo Jimenez was their ace. Worst-case scenario, Freeland experiences extreme regression as his high walk rate and lack of strikeouts come back to haunt him. Based on his stuff and pedigree, Freeland appears to have what it takes to stay in the rotation down the road, but if not, there will always be a role for him in the bullpen, where he can go and throw 75 % fastballs (or more) while generating a ton of ground balls (a la Scott Alexander). Either way, he looks like he can have big-league success while pitching in the big league’s toughest ballpark. Ever since he was taken with the second pick in the 2013 draft, the spotlight has continually followed Kris Bryant. After mashing his way through the minors in less than two years, Bryant had a spectacular rookie season with a slash line of .275/.369/.488 with 26 homers and a 136 wRC+. Deservedly, he was rewarded with the NL Rookie of the Year award. Although he did strike out over 30 percent of the time, he showed great plate discipline along with immense power. His 6.5 WAR ranked 10th among major league hitters. However, this year he has taken his production a step further. With his league-leading 25 home runs to go along with his slash line of .278/.370/.578, one major change sticks out. Although his average and on-base percentage remain around the same as his 2015 totals, his slugging percentage has taken a huge jump. Halfway through the season, he is one home run shy of last year’s total and around half of his hits have gone for extra bases (44 out of 87). He’s also cut down on his strikeouts while making even more hard contact than he did last year — shown by his 42% hard-hit rate which will allow him to continue to tap into his power. One noticeable change sticks out in his batted-ball profile. Although his ground-ball, line-drive, and fly-ball rates remain relatively constant, Bryant has pulled the ball more in his second big-league season. This has caused more of his fly balls to leave the park. Taking a look at his 2016 home-run spray chart, you can see that all of his home runs have been pulled. Next take a look at his 2015 home-run spray chart. …will continue to be common for Cubs fans to see from Kris Bryant. 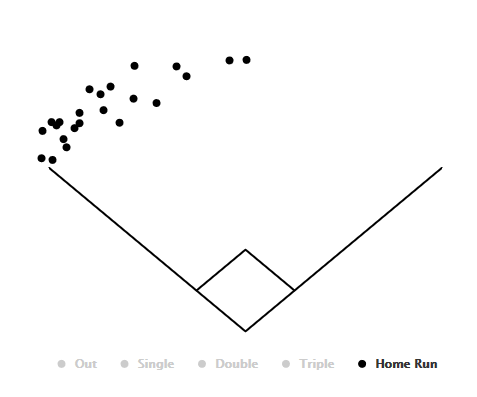 However, it would be foolish to simply call Bryant a home-run hitter when in fact what makes him so special is his all-around hitting ability to go with this insane power. He walks, hits the ball hard, and his only flaw is his propensity to strike out — and even that he has improved upon this year. A two-time All Star already with 4.3 WAR this season, he ranks fourth among major-league hitters and first among NL hitters in WAR while also possessing a 149 wRC+. At this point, if the NL MVP is going to go to a player not named Clayton Kershaw, Kris Bryant deserves to be the one holding up the trophy. But the trophy most important to him is the one won at the end of October. With the Cubs holding a comfortable lead atop the NL Central, Bryant looks destined to lead them on a deep playoff run with the hope of finally shattering their 108-year-old curse. After signing a massive seven-year, 217-million-dollar contract with the Red Sox this past offseason, David Price got off to a slow start. After his May 7th start against the Yankees in which he gave up six earned runs in just 4.2 innings, Price’s ERA stood at a whopping 6.75 yet his peripherals remained strong. He had a 2.98 FIP and 11.5 K/9. However, he was giving up hard contact over 41 percent of the time. The immediate fix was a mechanical issue noticed by Dustin Pedroia that was limiting Price’s leg lift and diminishing his velocity. Frustrated with his failures, Price vowed to be better. And better he has been. After throwing a gem in Sunday’s win over the Mariners where he went eight innings allowing his only run on a solo shot by Franklin Gutierrez, Price lowered his season ERA to a still high 4.24 and had his eighth straight quality start. Over those eight starts, Price has been much better, allowing 16 runs over 58.1 innings for an ERA of 2.47. During this stretch, he has a 3.88 FIP and 8.6 K/9 and has only allowed hard contact around 27 percent of the time. Although his strikeouts have gone down and his FIP went up due to his decrease in strikeouts to go with an increase in home runs allowed, Price has limited the amount of hard contact he has given up. This can be seen in the BABIP over the two stretches. In his first seven starts, his BABIP against was around .370, while in this current eight-start stretch it is hovering around .230. This in turn, has allowed him to be very successful while pitching to contact. His biggest issue remains his ability to keep the ball in the park. Over his last eight starts, Price has allowed at least one home run in seven of them. So while he has limited hard contact against him, the few mistakes that he makes each game are punished. Despite this increase in home runs allowed, he continues to pitch well and go deep into games, allowing the Red Sox bullpen a chance to recover after the consistently shaky starts from their 4th and 5th starters. There are a few main reasons to this improvement. The first was his ability to regain his velocity. Looking at his velocity each month thanks to data from Brooks Baseball, there is a small but steady increase in his average four-seam and sinker velocity. Before May 8th, his velocity was low by his standards. Typically a pitcher averaging 94 to 95 MPH with his fastball, he had been sitting 93 MPH. Although just a small dip in velocity, it made him much more hittable. Since May 8th, his velocity has been back on the rise. After the mechanical change, his four-seam has been averaging around 94 MPH and his sinker has been averaging around 93 MPH, but still slightly up from what it was before. Although it is a small increase, this added velocity has helped Price dominate hitters, gain confidence, and re-establish himself as an ace. Another key factor in this improvement has been his pitch usage. Using pitch data from Brooks Baseball, I was able to look at Price’s pitch usage. In his first seven starts, Price relied on mixing different types of fastballs with his main offspeed pitch being a change-up while also displaying the occasional curve. His four-seam was used around 28 percent of the time yet it lacked the movement displayed by his cutter and sinker. The high four-seam usage to go with decreased velocity spelled trouble for Price. However, since May 8th, Price has made an adjustment displayed by the fact that he is now using his sinker as his primary pitch while also using his four-seam far less frequently. His sinker is now used around 36 percent of the time compared to his four-seam being used around nine percent of the time. With this added movement and velocity, Price has been able to be more effective while keeping the use of his curve, cutter, and changeup around the same. This simple switch from a four-seam to a sinker has allowed him to go on a tear. Looking forward, the Red Sox need Price to continue to be the pitcher that he has been over his last eight starts. They are paying him ace money and he is expected to pitch like one down the stretch as Boston hopes to continue their great turnaround year. If Price continues to have outings like these, the Sox should like their chances come October with him taking the mound with their season on the line.